Why Should I Go to the PHA Forum 2014? Population health requires a steady flow of communication and collaboration in order to ensure that the comprehensive programs generate positive outcomes. The PHA Forum 2014, hosted by the Population Health Alliance, will be at the award-winning Fairmont Scottsdale Princess hotel in Scottsdale, Arizona from Dec. 10 to 12, and it is the perfect opportunity to hear from thought leaders in population health. The three-day forum will provide attendees with the opportunity to network and connect with others in the population health community and discover ways to strengthen their businesses. The PHA Forum 2014 will have it all, covering an array of topics representing the full scope of the industry, from how technology, big data and advanced analytics will play a role in population health, to learning how to build population health programs on a community scale. Some of the brightest minds in the health care and population health industries will be on hand to share their insights on the constantly evolving landscape. [Read more…] about Why Should I Go to the PHA Forum 2014? Summit brings together leaders from across the healthcare continuum to discuss how the industry is driving innovation to enable better healthcare delivery at lower costs for more people. MEA|NEA, the recognized leader in secure unstructured health information exchange and the provider of the FastAttach electronic attachment solution, announces that it is a sponsoring partner of the 5th annual Health IT Leadership Summit in Atlanta Nov. 20, 2014. As part of its sponsorship, MEA|NEA also is participating in the summit’s internship module where members of its leadership team will meet with students in attendance interested in internships and careers in the field of health information technology. Created in 2010 by the Georgia Department of Economic Development, the Metro Atlanta Chamber and the Technology Association of Georgia’s Health Society, the Health IT Leadership Summit brings together leaders from across the healthcare continuum to discuss how the industry is driving innovation to enable better healthcare delivery at lower costs for more people. 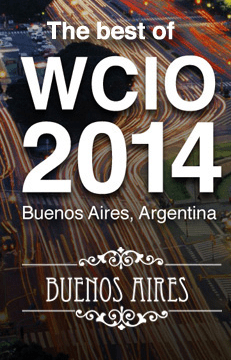 WCIO is expanding its international reach with The Best of WCIO 2014: Argentina. The conference will be held 16-17 October, 2014, in Buenos Aires, Argentina. WCIO worked closely with the local organizer to develop a program that provides exceptional educational.